Neptune Fountain - designed by Abraham van den Blocke and Arthur's Court. Arthur's Court is a complex of buildings forming a branch of the Gdańsk History Museum, located within the Main City boundaries and forming a part of the representative city route called the Royal Route. St. Mary's Church - the largest red-brick gothic church in Poland and Europe built between 1343-1502. Oliwa - The cathedral famous mainly for its rococo organ, inside the cathedral there are 23 altars artistically sculptured. Three architectural styles are represented: renaissance, baroque and rococo. DAR POMORZA (Gift of Pomerania), called the White Frigate, has been associated with Gdynia since 1929. She was built in 1909 in the Blohm & Voss shipyard in Hamburg as a training ship for the German merchant maritime school. Monte Casino Street (ul. Bohaterów Monte Cassino) is the center of Sopot, a pedestrianised promenade. At the end of Monte Casino you'll find the Wooden Pier (Molo). WHICH IS WORTH VISITING AROUND TRÓJMIASTO? 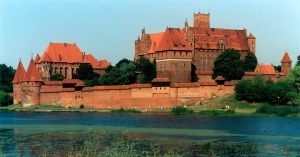 MALBORK (about 80 km from Gdańsk) Grand Master Siegfried von Feuchtwangen moved his office to Malbork in 1309. The castle was promoted to the status of being the capital of one of the most powerful states on the southern coast of the Baltic. It soon became apparent that it could not fulfil its new functions in its current form. Upside Down House situated about 50 km from Gdańsk.